HELLO Movie Review: Director Vikram Kumar’s Telugu movie Hello featuring Akhil Akkineni and Kalyani Priyadarshan in the lead roles has finally released on Friday, December 22nd in the huge number of screens in the Telugu States and Overseas And received positive reviews and rating from the audiences across the globe. Hello Movie is a romantic action thriller film, Nagarjuna Akkineni has produced the movie under his banner Annapurna Studios. This much-hyped flick, which has the runtime of 131 minutes, has got a U certificate from the censor board. Its story is all about a young boy and girl getting separated in their childhood and reuniting after 15 years. The girl gives her phone number to the boy and he keeps on calling her for 15 years, but she doesn’t answer the call. This film is a youthful action thriller and has a mix of everything – childhood romance, drama, family bonding and loads and loads of action. Excellent technical values are the strength. A special shout out for Stunt master, Cameraman. Vikram Kumar style sensibilities in which Akhil calls Ramyakrishna ‘Amma’ scene came out well. Vikram Kumar’s screenplay and action sequences of Akhil will leave everyone in awe of the movie. Especially, the adventurous stunts performed by Akhil will standout. Background Score composed by Anup Rubens is absolutely fabulous. Production Values maintained by Annapurna Studios set a high standard. Performances: Akhil looked uber cool, impresses with his dances, singing and original acts in fights. He is so natural in his histrionics and performance. However, his presence is limited in the first half and even that limited screen time he got is majorly occupied with action sequences. In the second half, he has some scope to act and he did a decent job. The amount of work that Akhil has put in is clearly visible on screen in parkour-style chase sequences and in dances. Kalyani, the debut heroine, is a perfect fit for Priya role. Though she is not a great beauty, she has class and elegance. Ramyakrishna and Jagapathi Babu look good as the couple who adopt seenu. Sentimental scenes between the family are good and ‘Diamond Ring’ episode also brings few waves of laughter. Ajay, as the boss of phone theft gang, starts off as a serious villain but ends up as a comedy one. Anish Kuruvilla, Satya Krishnan as parents of heroine are adequate. Technical: Hello Movie has rich production values and Anup Rubens’ songs and background score, PS Vinod’s cinematography, the amazing choreography of stunts and dance sequences are the attractions on the technical front. Final Verdict: Overall Hello Telugu Movie is A Perfect comeback for Akhil Akkineni Such a lovely pair on-screen Akhil & Kalyani Priyadarshan Director Vikram is a magician who can effortlessly make the audience fall in wid outlandish/bizarre ideas! Jagapathi-Ramya-Akhil and Seenu-Junnu scenes r brilliant! An emotionally charged crisper climax created magic! 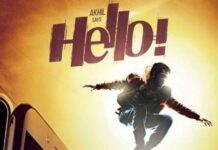 Hello Movie is a youthful action thriller and has a mix of everything – childhood romance, drama, family bonding and loads and loads of action. Excellent technical values are the strength. 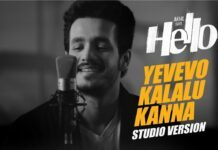 Akhil Akkineni Singing ‘Yevevo Kalalu Kanna’ Song From HELLO!